Which workflow tasks have been eliminated or need to be reassigned? What role(s) does each person manage? 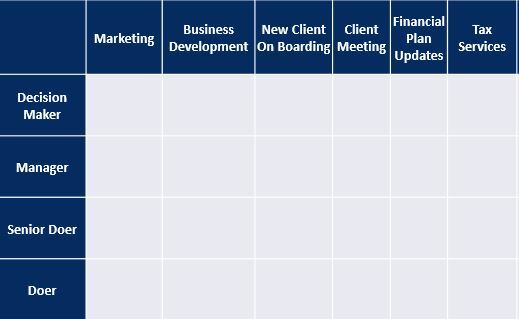 What are the top 5 client and non-client facing responsibilities of each role? Are my staff happy with their roles? Should we invest in formal training and mentoring to re-purpose staff into different or new roles? Now it is time to map out a long-term path for the business and team. A mere 14% of advisory firms document a plan for how their organizational structure will need to evolve over time, and only 28% feel their current structure is sufficient to effectively support current and future hiring decisions (1). By aligning existing needs with future needs, you can best define roles and maximize the contribution – and satisfaction – of each employee. Use these probing questions and role map (below) to help design a team structure that manages the modified workload and drives future growth. What skill sets and knowledge are needed to grow the business? What roles are necessary to deliver our desired service level? If we want to attract younger clients, do we need younger advisors on the team? Do we need non-advisor roles to better manage the business? Do we need specialists or all-rounders that wear multiple hats? A mix of both? How do we want staff to evolve and grow with our business? According to an Investment News and Moss Adams Compensation study, the “best firms avoid internal structures that create boundaries around their organization’s capacity.” The best firms hire fewer people and avoid hiring under-qualified staff, considering outsourcers, and only the higher level, process-oriented positions that have the most impact, e.g. senior, junior and associate advisors and COO/operations managers (2). An employee with the right skills can get the job done, but an employee with the right skills and a passion for the work can transform the way things are done. Personality and instinct assessment tools like those from Kolbe and Foursight will help you identify team members’ natural strengths, problem-solving approach and intrinsic motivators. Career tracks can also be defined with the help of outsourcers. With less than half of today’s advisory firms executing formal training and mentoring programs (3), another viable option is to team up with an outsourcer to manage the current workload and train an internal staff member to take on the work and grow into the position. Without a succession plan or future career path, both owners and employees can grow frustrated and dissatisfied. Yet a majority of advisers are not building a business with a clear view to exit – only 25% of financial advisors have a succession plan in place to ensure their business transitions appropriately (3). Creating a succession plan or a path to partnership motivates employees to take ownership and truly advance the business. It also motivates owners to hire people that are vested in the company, not just clocking in and out. You can start with FP Transitions EMS program to step into this process slowly and methodically. 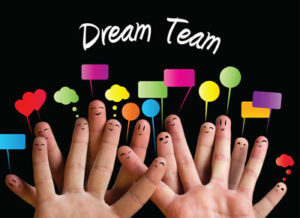 An evolved team structure and clear path for business and staff make the new hiring process more exact and efficient. With improved processes, smart integrations, and placing the right people in the right roles, your business with thrive with less effort. And each employee will maximize their contribution to allow your firm to hire more rock stars that will accelerate the careers of your current team. With the right approach to staffing, you can engage employees at their highest potential, helping to attract only the best talent, and map a path for sustainable growth. PS. Want to talk more about how I help businesses make transform and operate better? Click HERE. Want to receive my monthly solutions email? Click HERE. 1 TD Ameritrade Whitepaper, Breakout Growth: Adding Key Positions to Unlock Growth Potential and 2011 FA Insight Study of Advisory Firms, People and Pay. 2 2013 Investment News / Moss Adams Adviser Compensation and Staffing Study found here.